View More In Glue Gun Sticks. Hot Glue Gun - Add happiness to your life! ★Can be used in all types of product assembly, such as small joint assembly, large surface lamination, mounting and trip attachment. ★Can be used in furniture assembly to adhere small joints, mounting and trim. ★Can be used in Building and Construction. Particularly: hand-made, kids toys, pc boards, bijouterie, jewelry, shoes production, electronics and industry. 【Handy Glue Gun Set for Crafts and Repairs】GooBang Doo Abox 60w hot melt glue gun is heavy duty model, made of advanced engineering plastic case, stronger, wear - resistant and impact - resistant, an ideal tool for home, office and school DIY and daily basic repairs. 【Built-In Fuse & On/Off power button】Built-in fuse prevents it from overheating, makes it safer to use. On/ Off switch makes it more convenient to use as there is no need to unplug and plug in the gun frequently when you just leave for a moment. 【Bonus: 15pcs Glue Sticks with Strong Adhesiveness】Comes with 15pcs high quality environment-friendly glue sticks (5.7 in), with super strong adhesive and easy cleaning properties, can work on wood, plastic, glass, metal, stone, ceramic, brick, paper, wicker, lace, cotton, fabric and other materials. 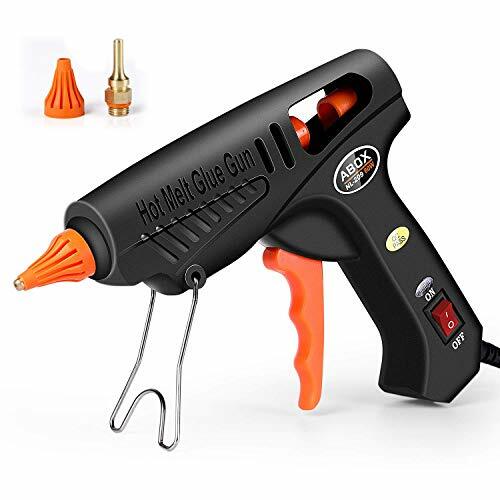 【Heat up quickly and Constant Temperature】This 60w glue gun is made of high-tech electronic ceramic PTC, which instant heats up within 3-5 minutes and melt the glue stick quickly and maintain constant temperature automatically to prevent the gun from overheating. 【Removable cooper nozzle and anti-hot cover】The cooper nozzle won't rust and heat up quickly to ensure the melted glue ooze out smoothly. The nozzle is wrapped by orange rubber anti-scald cover. The size of the nozzle allows it to be used in more appliances. The package comes with an alternative nozzle. If you have any questions about this product by GooBang Doo, contact us by completing and submitting the form below. If you are looking for a specif part number, please include it with your message.